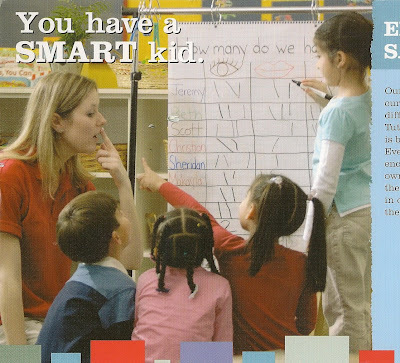 I was just tossing out the junk mail when I came across a glossy ad with kids on it and the words "You have a SMART kid" emblazoned across the front. I paused a moment and looked closer, because so often in today's society parents are hearing things like "your child is out of control", or "your child is not living up to his potential", rather than "you have a bright and well adjusted child!" Of course, it's a ploy by advertisers who create a problem and then hand deliver a solution so you will buy their product. I paused a moment and thought how refreshing it was to see a childcare center trying to get business by buttering you up with the whole "Smart Kid" thing. But then I looked closer at the photo. The big flip chart the kids are working on says "How many do we have?"... Please note that by their reckoning, Jeremy has three eyes, along with Beth, Scott, and Sheridan. Beth also has three mouths. We don't actually see the faces of the kids to judge for ourselves. So either this is a school for alien children, or else the kids currently at the school aren't so smart, and the ad is an plea for parents with smart kids to help bring up the "smart" levels.